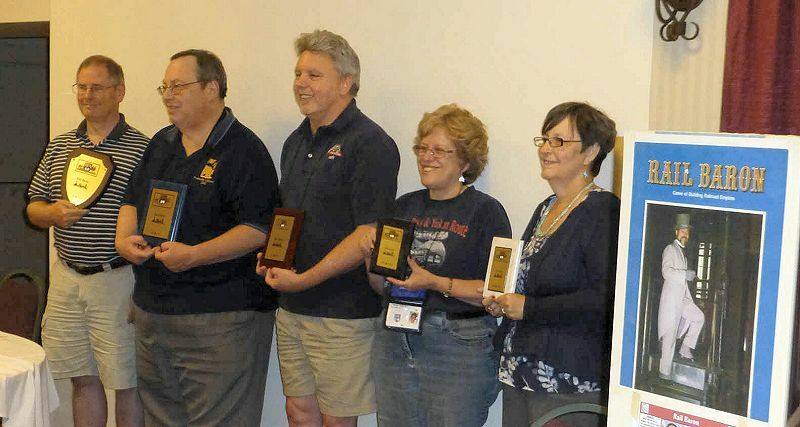 From left to right: Brian Conlon (2014 champ), Brian Smith, Jeff Jackson, Donna Balkan, and Sue Lanham. Picture above courtesy Paul Van Bloem, account below courtesy Ron Secunda. This year's tournament was quite exciting. For one thing, the number of players who won two of the first-round heats was the highest since I have been GM. Congratulations to Brian Conlon, Paul Van Bloem, John Henry, Donna Balkan, and Sue Lanham. Also, one player in the Final got close enough to victory to taste it twice, only to have it disappear twice! The holdings for the Final players when all properties had been purchased were: Brian Conlon: AT&SF, CMSTP&P, CB&Q, SOU, IC. Brian Smith: PA, NYNH&H, B&M, UP, RF&P, SLSF, T&P. Jeff Jackson: NYC, SP, L&N, C&NW, NP. Donna Balkan: B&O, WP, D&RGW, CRI&P, GN, ACL, GM&O. Sue Lanham: C&O, SAL, MP, N&W. One player in the Final went bankrupt. Sue's future looked bleak early on when, sitting in Seattle, she rolled San Diego as a destination, while the AT&SF, UP, and SP had already been purchased. From there, things didn't get much better. Surprisingly, it was Brian Conlon, not Sue, who first had to auction railroads. The first was the IC to Jeff for 15K, and then his SOU to Brian Smith for 29K. Sue had to auction her MP off to Brian Smith for $27.5K, and her downward spiral continued. She auctioned off her N&W to Jeff for $12K, her SAL to Donna for $10K, and her last railroad, the C&O, to Brian Conlon for $10K. Jeff was the first player to announce $150K. Jeff subsequently found himself in Chicago with $213.5K, but then had to travel to two hostile destinations, Boston and Des Moines. At this time, Jeff's only competition (cash-wise) was Brian Smith, who announced $150K. Jeff's next destination after Des Moines was New York City. After reaching New York with plenty of cash on hand, he declared for his home city of Charlotte. Unfortunately, whereas he needed a 10 to win the game, he only rolled a 6, and retreated northward, where he was rovered near Albany anyway by Brian Smith, who had rolled a 16! Now, Brian Smith had $221K, but was on his way to a hostile Detroit. Jeff proceeded to his alternate destination, San Antonio, and had $201.5K upon arriving. His next destination was Boston, and Brian Smith, fearing Jeff would again be in a position to return to Charlotte, began an epic journey through several regions on an assortment of owned and unfriendly railroads to stay nearby. Meanwhile, Donna announced over $150K, and Brian Conlon had arrived in Los Angeles and announced with $175K. Eventually, neither Jeff nor Brian Smith could declare for home, and they both had to head to destinations out west, Jeff to Los Angeles, and Brian to Spokane (with $266.5K) on board. Any BPA GM who wishes to create a Web page for his/her game is welcome to copy the HTML of this page and modify it as needed. Rail Baron is an internationally registered trademark of Intersystem Concepts, Inc.